The government should be found in contempt of Parliament, a committee of MPs decided Monday over the objections of Conservative MPs. The Conservative government is in contempt of Parliament, a report by a committee of MPs tabled Monday concludes. The government's failure to produce all documents that had been requested from it or to provide a satisfactory explanation for withholding them impedes the ability of MPs to carry out their duties, the report said, and the government is therefore in contempt. The 26-page report was tabled late Monday afternoon and 48 hours must go by before the House of Commons can vote on whether to accept the committee's report. The finding is a historic one and it paves the way for the Liberals, or any of the other opposition parties, to move a non-confidence motion on the matter and bring down Prime Minister Stephen Harper's minority government. The procedure and house affairs committee began meeting early Monday morning to finalize a draft of the report that had been prepared over the weekend following two days of hearings last week. The committee was tasked with deciding whether the government breached the privilege of MPs by not supplying sufficient documentation on the estimated costs of corporate tax cuts, proposed crime legislation and the F-35 fighter jet procurement. Some amendments were made and the final report was made public Monday afternoon. Do you agree with the MPs' report? Take our survey. "This contempt report — a first in the history of Canada and the Commonwealth — is the result of the Harper regime's abuse of power," Liberal Leader Michael Ignatieff said in a statement. He added that the finding undermines the credibility of the federal budget that is set to be delivered Tuesday, because the government can't be trusted. Conservative MPs on the opposition-dominated committee did not support the contempt finding and issued a dissenting report. It said that the opposition MPs had "pre-judged the outcome of the hearings before they had even begun" and "ignored" information provided by the government. "The report tabled by the committee is simply a piece of partisan gamesmanship that diminishes the important work of Parliament," the dissenting report states. The motion is expected to be debated Wednesday or Thursday and is scheduled for three hours of debate. Because Wednesday is a short sitting day in the House of Commons, the debate may have to continue next week to get the full three hours. If the debate happens Thursday, the vote will take place March 30. As he entered the meeting Monday morning, Liberal MP David McGuinty predicted the Conservative MPs on the committee might try to filibuster the debate on the report to prevent it from being finalized. But Conservative MP Tom Lukiwski said the government would not stand in the way of the report. He referred to the committee as a "star chamber," suggesting the opposition MPs had already reached their conclusions before last week's hearings had begun, and said the government is not guilty of breaching the privileges of MPs because it has complied with a ruling from Speaker Peter Milliken. The committee met for three days last week to hear witnesses on two breach of privilege issues, one involving the cost estimates, and the other on whether International Cooperation Minister Bev Oda should also be found in contempt of Parliament. Oda stands accused of misleading Parliament about the insertion of the word "not" on a funding proposal by the aid organization Kairos, thus ending the group's federal funding. A separate report from the committee on Oda must be tabled by Friday. After voting on Monday's report, the MPs on the committee agreed to meet again Tuesday morning to finish dealing with the Oda file. Conservative MPs attempted to pass a motion calling on Milliken to appear at the meeting, but it didn't pass. 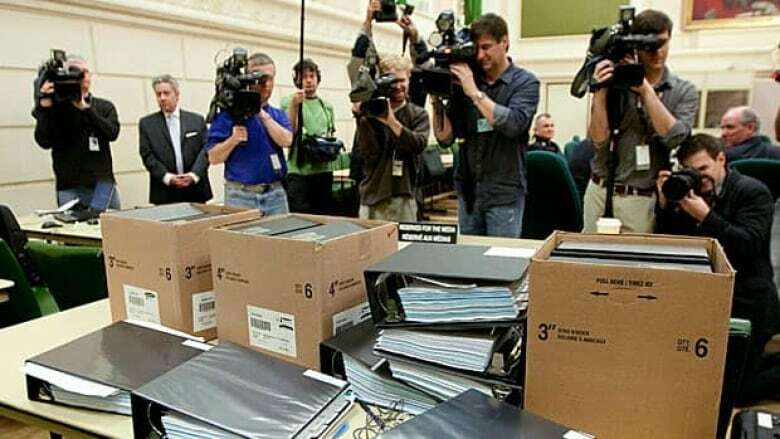 The dispute between the Conservatives and the opposition parties over the cost estimates has been dragging on since the fall of 2010. The original request to the government, asking to see detailed cost breakdowns for the jets and on the impact of corporate tax cuts and crime bills on the federal treasury, came from the Commons finance committee. Initially, the government said it could not release details of the estimates because they were protected by cabinet confidence, a principle that allows information to be kept secret and exempts it from access-to-information laws. The opposition argued that once a government announces its intentions publicly, on bills or other matters, the information is no longer protected by cabinet confidence. It continued to push the Conservatives for the estimates, and some were provided on Feb.17, but the dispute ended up in the hands of Speaker Peter Milliken. He ruled there appeared to be a breach of privilege, which put the matter back in the hands of MPs to decide the punishment. Monday's committee report could lead to the introduction of a non-confidence motion in the government as a consequence for its contempt finding. On Tuesday, the government will deliver the budget and it could also trigger an election later in the week if the Conservatives do not get the support of at least one opposition party. The Conservatives argue they have provided all of the information that has been requested of them and that they have complied with Milliken's ruling. When Justice Minister Rob Nicholson and Public Safety Minister Vic Toews appeared at the committee last week, they brought binders full of what they said was even more detailed information than what they had already provided. The opposition, however, said the pages were filled with text of the crime bills and still did not contain the details they are seeking. Opposition MPs say they cannot be expected to vote on legislation without knowing how much it is going to cost taxpayers.